For Ezra had prepared his heart to seek the law of the LORD, and to do it, and to teach in Israel statutes and judgments (Ezra 7:10 ). The Jewish people spent seventy years in Babylonian captivity. At the end of this time, the Persians and Medes conquered Babylonia. It was at this time that the Jewish people were allowed to return to their homeland to rebuild the Temple, the wall, and the city. The leadership for this reconstruction, this revival, fell upon a number of men, one of which was Ezra. The verse of Scripture above tells us that Ezra had prepared his heart to do the work and will of God. 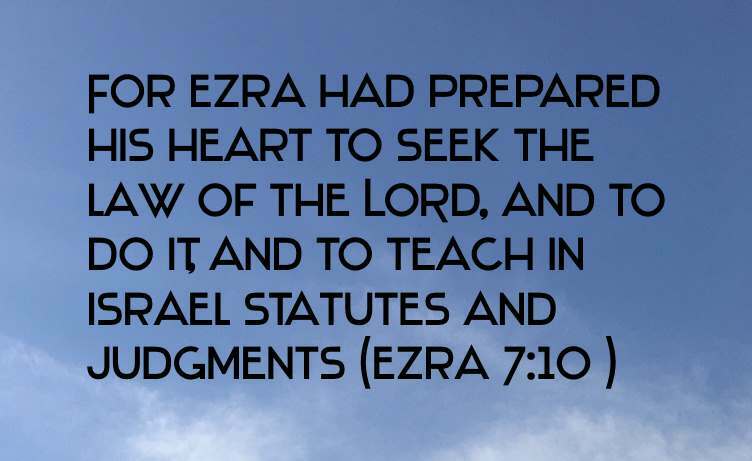 We will look at Ezra as an example of what “a prepared heart” looks like to carry a burden for revival by looking at the characteristics of Ezra's prepared heart. This Ezra went up from Babylon; and he was a ready scribe in the law of Moses, which the LORD God of Israel had given ( Ezra 7:6). Easton's Bible Dictionary says that "after captivity, scribes turned their attention to the law gaining for themselves distinction by their intimate acquaintance with its contents". That is exactly what we need to do today - become acquainted with the Bible and the truth so we can win lost souls to the Lord. And Ezra opened the book in the sight of all the people; (for he was above all the people;) and when he opened it, all the people stood up: And Ezra blessed the LORD, the great God. And all the people answered, Amen, Amen, with lifting up their hands: and they bowed their heads, and worshipped the LORD with their faces to the ground (Nehemiah 8:5, 6 & 8). Ezra knew that complete restoration – complete revival meant more than just re-establishing the people in the land, rebuilding the temple, the city and the wall – it meant that the people would have to commit themselves to the one true God – putting idolatry and other sins out of their lives. So Ezra renewed the Law by teaching it to the people. 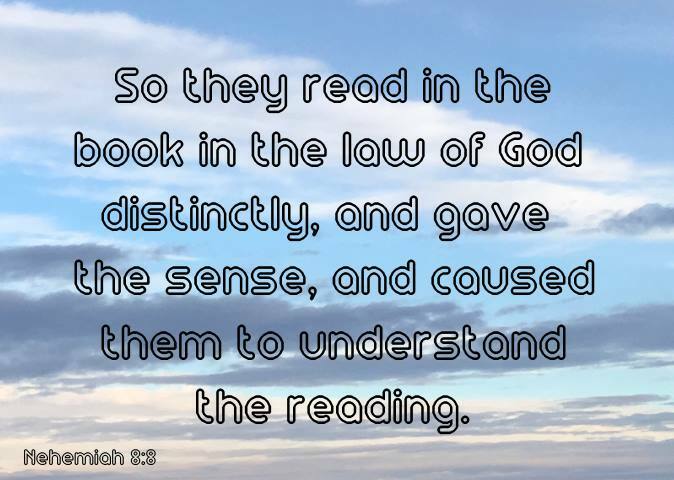 So they read in the book in the law of God distinctly, and gave the sense, and caused them to understand the reading (Nehemiah 8:8). And that from a child thou hast known the holy scriptures, which are able to make thee wise unto salvation through faith which is in Christ Jesus. All scripture is given by inspiration of God, and is profitable for doctrine, for reproof, for correction, for instruction in righteousness (2 Timothy 3:15&16). And all things are of God, who hath reconciled us to himself by Jesus Christ, and hath given to us the ministry of reconciliation (2 Cor 5:18). A prepared heart today, having a ministry of reconciliation, means that we will go into the "highways and hedges" (Luke 14:23) and cause revival by teaching the Gospel of Jesus Christ. There, by the Ahava Canal, I proclaimed a fast, so that we might humble ourselves before our God and ask him for a safe journey for us and our children, with all our possessions. I was ashamed to ask the king for soldiers and horsemen to protect us from enemies on the road, because we had told the king, "The gracious hand of our God is on everyone who looks to him, but his great anger is against all who forsake him. 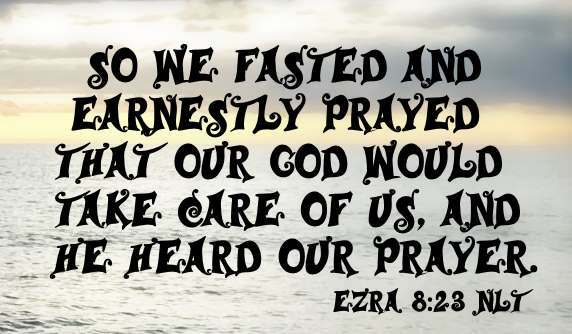 So we fasted and petitioned our God about this, and he answered our prayer (Ezra 8:21-23 NIV). ..... and the king granted him all his request, according to the hand of the LORD his God upon him (Ezra 7:6). If you read in Ezra 7: 11-26 you can see what Artaxerxes granted Ezra, and in Ezra 7:27&28 you find Ezra thanking and praising God for arranging a blessed voyage and the reconstruction – the revival of Jerusalem. So why did Ezra declare the fast at the assembly at Ahava? Ezra 8:21 NIV says that Ezra proclaimed the fast “so that we might humble ourselves”. Ezra knew that they had to be humble to receive God’s promises and fasting brought on this necessary humility. I have been taught that fasting brings about right attitudes and spirits. Nineveh stayed the hand of God’s judgments by fasting (Jonah 3:5). The Apostle Paul humbled himself in fasting while awaiting the visit of Ananias in Damascus (Acts 9:9). We need the right attitude and spirit when we are teaching or preaching the gospel to the lost. A Prepared Heart Travails and Intercedes for others in Prayer. Now when these things were done, the princes came to me, saying, The people of Israel, and the priests, and the Levites, have not separated themselves from the people of the lands, doing according to their abominations (Ezra 9:1). And when I heard this thing, I rent my garment and my mantle, and plucked off the hair of my head and of my beard, and sat down astonied (Ezra 9:3). Even though Ezra had not sinned in this matter himself, he took responsibility as a member of the nation of Israel. At the evening sacrifice I arose from my fasting; and having torn my garment and my robe, I fell on my knees and spread out my hands to the Lord my God. 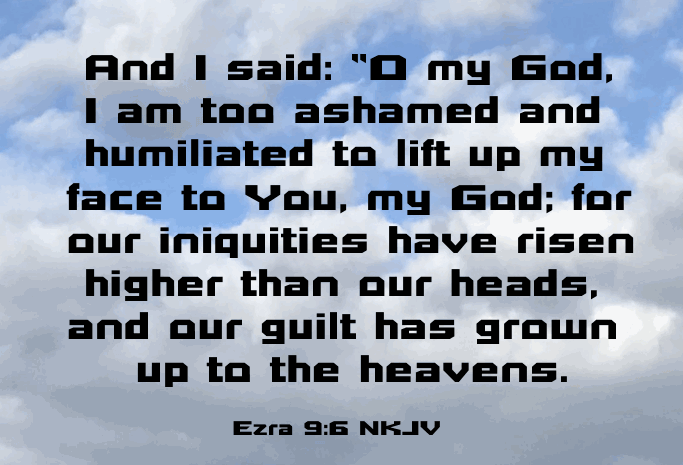 And I said: “O my God, I am too ashamed and humiliated to lift up my face to You, my God; for our iniquities have risen higher than our heads, and our guilt has grown up to the heavens (Ezra 9:5,6 NKJV). This tells us that Ezra did not want the revival of Jerusalem to fail because of others sins. He did not personally take the blame for the other’s sins but he took on the responsibility of interceding for others. Similarly, after we have taught the gospel, we need to intercede to God for their souls and to cause revival. And I sent them with commandment unto Iddo the chief at the place Casiphia, and I told them what they should say unto Iddo, and to his brethren the Nethinims, at the place Casiphia, that they should bring unto us ministers for the house of our God (Ezra 8:17). Ezra knew that they needed ministers if He wanted God’s blessings for the revival he was leading. Ezra showed the necessary respect for God’s ordained minister. Similarly we must have the necessary respect for our Pastor – God’s ordained minister if we want revival today. The Apostle Paul first visited Corinth about 50 AD. We know there was a great revival in Corinth because four years later he wrote his first letter to “the church of God which is at Corinth” (1 Cor. 1:2). Paul admonished the Church of Corinth on many subjects in this letter including “immorality”. Would the revival in Corinth continued, if they hadn’t listened to his admonishments? Shall not God search this out? for he knoweth the secrets of the heart (Psalms 44:21).